The present scourge of anti-Arab and anti-Muslim bigotry in our country is rooted in a calculated, insidious effort to contaminate our public discourse. This effort dates back to the early 2000s, when a small, interlaced network of analysts and activists exploited a nationwide climate of fear in the aftermath of 9/11. To be sure, the systemic mistreatment of Arab American and American Muslim communities did not begin with the new millennium. However, the success of this so-called network to mainstream hateful rhetoric and advance discriminatory policies is considerable, and thus deserves outsize attention. In 2011, The Center for American Progress (CAP) published “Fear, Inc. The Roots of the Islamophobia Network in America. "1 The report found that a nationwide rise in anti-Muslim bigotry was traceable to a handful of “misinformation experts.” These individuals and their organizations relied on a syndicate of activists, media partners, and grassroots organizing to radiate bias presented as fact. They also relied on significant financial support from a select group of charitable foundations. This network of donors, analysts, and activists not only distorted millions of Americans’ understanding of Islam and Muslims, it also drove inequitable policies. One example highlighted in the report was that of so-called “anti-Sharia bills”2 intpoduced in numerous state legislatures. Most of these bills drew from model legislation drafted by David Yerushalmi,3 an SPLC-designated "anti-Muslim extremist." CAP released a follow-up in 2015 entitled “Fear Inc., 2.0. The Islamophobia Network’s Effects to Manufactured Hate in America.”4 While the revelations of CAP’s initial report led charitable organizations, politicians, and the media to sever ties with many of the network’s key members, the 2015 edition also found that individuals within the network had successfully advanced a range of anti-Muslim policies at the local, state, and federal level. Some of those policies included the extensive targeting and surveillance5 of American Muslim communities by local law enforcement, the continued passage6 of anti-Sharia bills in statehouses across the country, and the adoption of anti-Muslim training materials7 within the FBI. Regarding the configuration of the network itself—little had changed between 2011 and 2015—the same clutch of misinformation experts and activists comprised the mainstay of anti-Muslim invective. Along with its 2015 report, CAP released an interactive website8 complete with a systematic rendering of the network. Drawing on the tax returns of key organizations and select charitable foundations, CAP’s research identified and exposed the catalysts of nationwide anti-Arab and anti-Muslim bigotry. Their work was groundbreaking. Fear Inc., 2.0. relied on financial records dating between 2001 and 2012. Two years since its publication, we now have access to updated tax information that can shine new light on the sprawling, deeply embedded network of monetized hate. One of many revelations to come out of the Fear Inc. reports was the financial incentive inherent to the network. A cadre of analysts and activists—parochial provocateurs—established a cottage industry peddling prejudice, filling their pockets in the process. Between 2013 and 2015, seven organizations identified in the Fear Inc. reports raked in roughly $67 million in total revenue, up 6 percent from 2010-2012. When we include the American Freedom Defense Initiative and the American Freedom Law Center, both founded in 2011 by CAP-designated anti-Muslim activists, that number swells to nearly $73 million. The combined 2013-2015 income of six individuals first identified in the Fear Inc. reports was $5,540,150. David Horowitz of the David Horowitz Freedom Center9 was the highest earner among them, receiving nearly $1.8 million in reportable compensation over a 3-year period. He was followed by Frank Gaffney of the Center for Security Policy10 ($955,854) and Daniel Pipes of the Middle East Forum11 ($825,000). Robert Spencer of Jihad Watch collected $716,361, while Pamela Geller of the American Freedom Defense Initiative12 made $714,816. During this same period, Brigitte Gabriel of ACT For America13 claimed $535,000 in the form of “business transactions” from her organization. The salary of the Investigative Project on Terrorism’s14 Steven Emerson was not disclosed. Many of the individuals first identified in the Fear Inc. reports turn hate for a considerable profit. The question remains: where do they get their money? While the major donors are still in play, funding to the network has indeed changed since the years cited in CAP’s most recent report. Between 2013 and 2015, the network lost some of its principal contributors and acquired newfound support from two charitable foundations. Among the eight foundations identified as major funders to the network in Fear Inc., 2.0., four have since withdrawn. Tax returns indicate that both the Russell Berrie Foundation21 and the Newton D. and Rochelle F. Becker Foundation22 have severed ties with anti-Muslim organizations in recent years. And while the Alan and Hope Winters Family Foundation23 contributed $60,00024 to the network in 2013, records from 2014 and 2015 also suggest withdrawal. Rounding off the list is the Fairbrook Foundation,25 which despite nearly $2 million in past donations to anti-Muslim organizations, reported zero involvement26 with the network between 2013 and 2015. Four of the charitable foundations first identified in the Fear Inc. reports continue to direct vast amounts of money to the network’s key members. The Abstraction Fund32 is one of several foundations linked to the Sears Roebuck fortune. Its director, Nina Rosenwald, has earned the nickname, “the Sugar Mama of anti-Muslim Hate”33 for her persistent support of the network’s main actors. The Middle East Forum received over $1 million34 from the Abstraction Fund in 2015 alone. Rosenwald is also the president and director of the Gatestone Institute,35 a NY-based think-tank “dedicated to educating the public about what the mainstream media fails to report.” A majority of Gatestone’s work36 is focused on the supposed threat of Muslim refugee migration on Europe and the West. In 2014, the Gatestone Institute received $1,015,00037 from the Abstraction Fund. The Lynde and Harry Bradley Foundation38 is a preeminent supporter of conservative organizations. According to its website,39 the Bradley Foundation “pursues a mission to restore, strengthen, and protect the principles and institutions of American exceptionalism.” Despite its stated mission, the foundation has contributed millions of dollars40 to the foremost catalysts of anti-Arab and anti-Muslim bigotry in our country. Scaife Foundations41 likewise contribute to conservative causes and institutions. Notable beneficiaries include the American Enterprise Institute for Public Policy Research, the Heritage Foundation, and the Hudson Institute. Between 2013 and 2015, Scaife Family Foundations gave $1.2 million42 to the David Horowitz Freedom Center and the Center for Security Policy. Unlike other donor-advised plans, DonorsTrust is absolutely committed to a clearly defined purpose and mission–supporting causes and public policies that preserve our constitutionally protected liberties and strengthen American civil society through private institutions rather than government programs. Neither the Eugene and Emily Grant Family Foundation nor the MZ Foundation was profiled in the Fear Inc. reports. In recent years, both have contributed a significant amount of money to leading anti-Muslim organizations. Established in the 1990s, the Eugene and Emily Grant Family Foundation is the philanthropic vehicle of real estate entrepreneur Eugene M. Grant. Most of the Grant family’s charitable giving49 goes toward arts and cultural enrichment in New York City and its suburbs. Between 2013 and 2015, however, the Grant Foundation gave over $4 million50 to the network, including $3 million to the Investigative Project on Terrorism, nearly $1.3 million to the Center For Security Policy, and $255,000 to the Middle East Forum. About 20 percent of the MZ Foundation’s total contributions and grants went to CAP-designated anti-Muslim organizations in recent years, amounting to almost $700,000.51 According to its website,52 the MZ Foundation is committed to combating anti-Semitism in the United States and across the globe. The foundation is named after Bay Area entrepreneur and philanthropist Myron Zimmerman. Between 2013 and 2015, MZ grants were made out to ACT For America, David Yerushalmi’s American Freedom Law Center, and Pamela Geller’s American Freedom Defense Initiative. The MZ Foundation’s greatest anti-Muslim beneficiary is the David Horowitz Freedom Center, which received almost $300,000 over the reported period. Other contributions to the network have occurred through anonymous donor-advised funds in recent years. Center for Security Policy received $813,00053 in a single donation processed through the Vanguard Charitable Endowment Program in 2013. In 2015, ACT For America secured an $83,000 payment54 through the National Christian Charitable Foundation, while an anonymous donor through the Jewish Communal Fund gave $238,08255 to the Clarion Project56 that same year. Anti-Muslim organizations also rely on support from within the network, shuttling money and accolades amongst themselves and forming a remunerative echo chamber in the process. 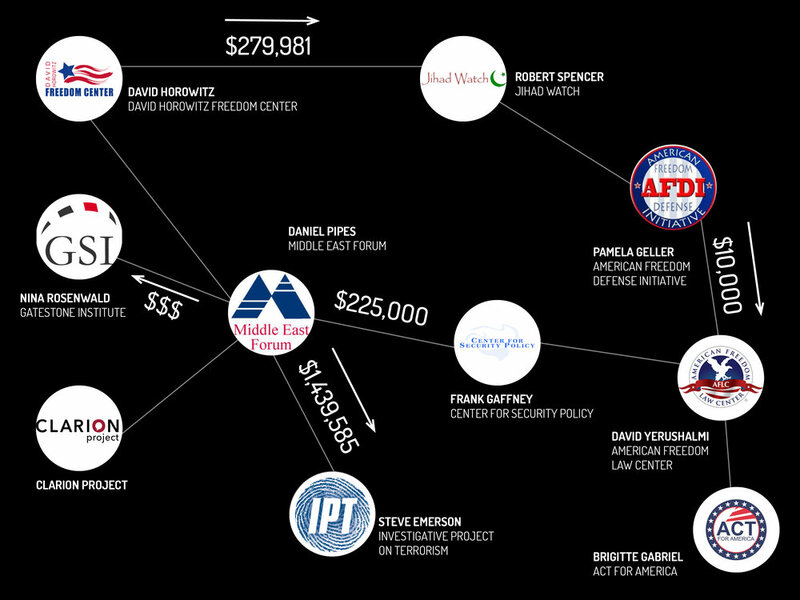 In 2015, David Horowitz gave $297,98157 to Robert Spencer’s58 website Jihad Watch,59 itself closely linked to Pamela Geller’s American Freedom Defense Initiative. That year, AFDI made a $10,000 payment60 to the American Freedom Law Center. Yerushalmi, AFLC’s co-president, has represented Geller61 in past defamation lawsuits. Frank Gaffney, the founder and president of the Center For Security Policy, serves on AFLC’s advisory board62 and has collaborated63 with Brigitte Gabriel and ACT For America. In 2014 and 2015, CSP received $225,00064 from Daniel Pipes’ Middle East Forum, which has donated $1,439,58565 to Steven Emerson’s Investigative Project on Terrorism since 2010. Pipes formerly sat on the advisory board66 of the Clarion Project, contributes to Nina Rosenwald’s Gatestone Institute, and, to come full circle, the David Horowitz Freedom Center. Bigotry weaves a tangled web. An incestuous network of analysts, activists, and their respective organizations forms the crux of anti-Arab and anti-Muslim bigotry in our country today. Their efforts to mainstream ignorant, hateful discourse and advance discriminatory policies rest on access to funding, the media, and political institutions. The financial underpinnings of this network are no-doubt complex, as evidenced in our strain to elucidate the labyrinthine connections between funders, organizations, and key individuals in the paragraphs above. Despite these challenges, we will continue to examine this sprawling, deeply embedded network of monetized hate.